The colder days of windy bursts of air and snowy mists are being forgotten. The warmer days of outdoor excitement and dazzling growth are being anticipated and readily welcomed. 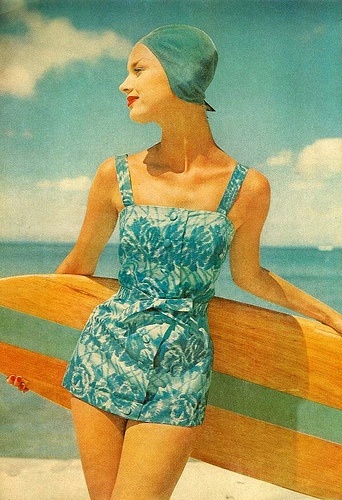 And in excitement over those sunny, beautiful days in the growing glow of nature, in eagerness to dazzle on the sandy beaches, to explore around fresh lakes and ponds, to relax by vivid blue pools, to swim amongst the refreshing waters, and to wear bathing suits that emit your individualistic spirit into the glittering environment of radiance, here are an array of bathing suits from the past decades that exhibit the wonderful, undeniable beauty of history and the fantastic days of warmth and sun. Throughout history, there have been a variety of dazzling, meaningful locations that have allowed modernity to prosper. These locations ignored restrictions and welcomed radical ideas, the nonconforming populations of freeness and spirited joy. There was an undeniable lack of restraint in these worlds of sparkling change and daring action. There was an indisputable embracement of choice in these worlds of elimination of past moral judgments and removal of what is not of current, beautiful modernity. Throughout the changing times in society, these locations awakened sensual abandonments and independent thoughts. These were the locations of individuals. These were the locations of modern, bold fashions. A wonderful variety of breathtaking fashions thrived within these magnificent places of delightful freedom. In these locations of sparkling thrill, fashions truly rose to their fullest power. They freely shined with an unforgettable boldness and a rejection of constraining ideologies. The fierce styles that emerged from the magical entrances of these novel locations carried within them this wonderful quality of modern beauty, this ability to to take hold of the contemporary and to never let it go. The fashions dazzled with this energetic movement, this inherent and viewable vivacity that twirled and danced to the sounds of the new world. And one of these locations of modernity and daring fashions was the speakeasy. 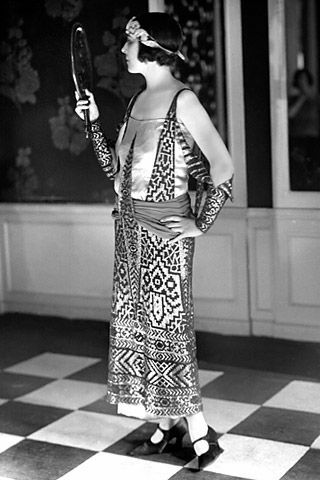 During the 1920s, the times of prohibition in the United States, the times of the rejection of Victorian moral constraints, the times of the wonderful evolutions in the arts, the times of new, freeing fashions, the times of bold, powerful flappers…the speakeasies in America rose to great appeal and shined in their rejection of societal codes and repressive, moral rules. These significant locations of the Jazz Age did not let unjust laws or past ideologies prevent their existence and prevent their successful glorification of the modern world. In thrilling speakeasies, the illegal liquor flowed without constraint. The freeing, rich sounds of jazz played with a contagious beat. The past worlds of limitation were long forgotten. 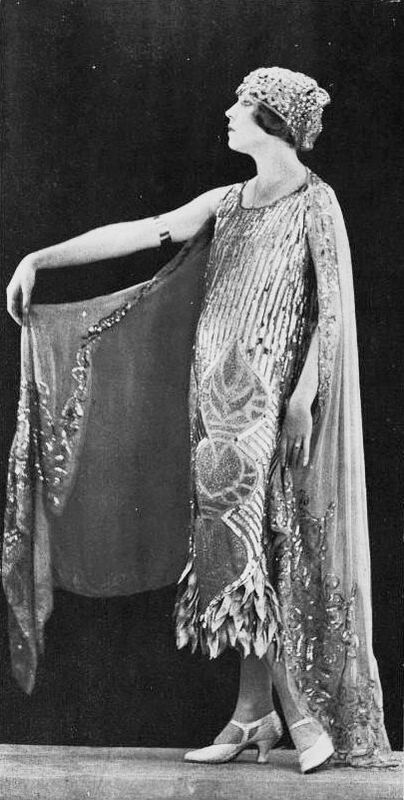 The independent, modern flappers gathered together in fearless dance, in fearless personality, and in fearless fashions. 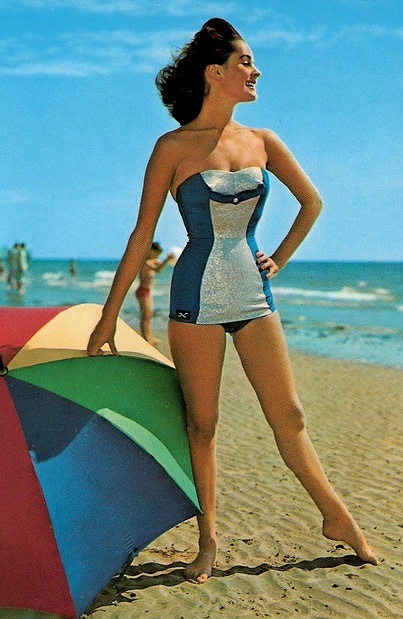 The modern location in history stimulated freedom, choice, and daring fashion. A free-spirit is someone who ignores the restraints of society, someone who acts based on his or her own fascinating mixture of ideas, emotions, and goals. This person is a person of independence, a person who is unafraid of the moral codes of daily existence. Conventions and judgments do not travel into the mind and soul–confining rules do not apply. A free-spirit is someone who pursues personal interests. The individual is not tied down to custom; rather, the individual believes in the freedom to do what is desired in life. 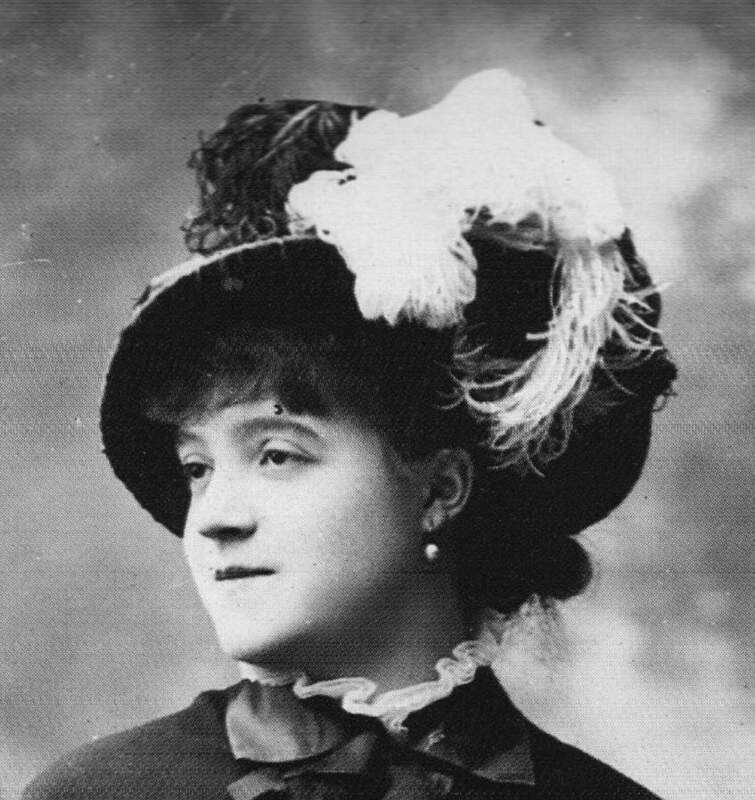 Ellen Andrée was a popular model and actress during the late 1800s. She was a talented, independent woman who was always herself, a woman who was not afraid to speak her mind, to act as her own person–to be her natural self. Born as Hélène Andrée, Ellen Andrée changed her name in the beginning of her life. Supposed to be a teacher, Ellen Andrée threw away this option to pursue her true interests and passions. She did not wish to be confined to the restrictive gender norms set out before her. She did not want to live the typical life pushed towards her direction. She had no desire to do something she did not wish to do. Andrée decided to gravitate and embrace her real loves in life, her love for strength, her love for theater, her love for the arts. 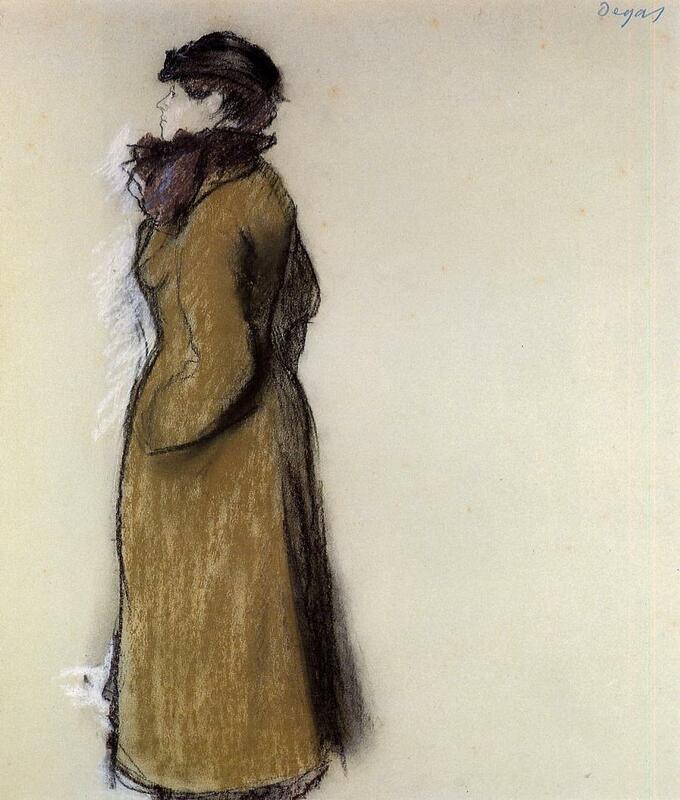 Starting at a young age, Andrée interacted with many of the Impressionist artists of the time. 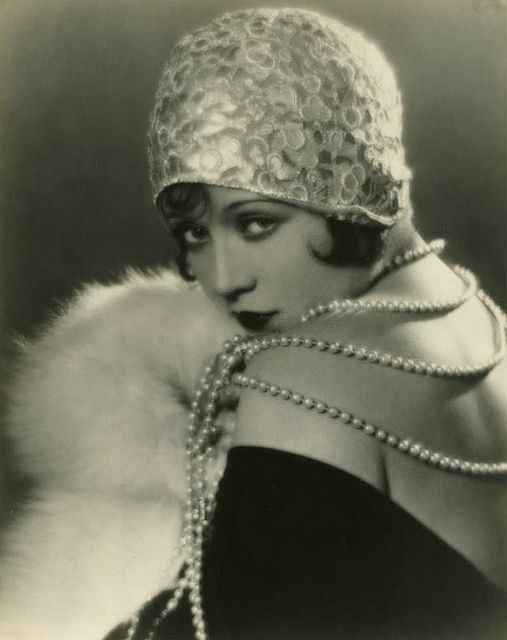 She acted in comical vaudeville productions. She became a pantomime actress in the Folies Bergère. She was a significant actress in André Antoine’s naturalist theater. Ellen Andrée was supposed to be someone else in life–someone who hopelessly carried on an unwanted existence of gender constriction. However, Ellen Andrée did not accept this future planned for her. She lived her life through her own recognized free-will and natural charm. She lived her life through her wittiness and spoken actions and words. She lived her life based on her own desires. She lived her life as a free-spirit. 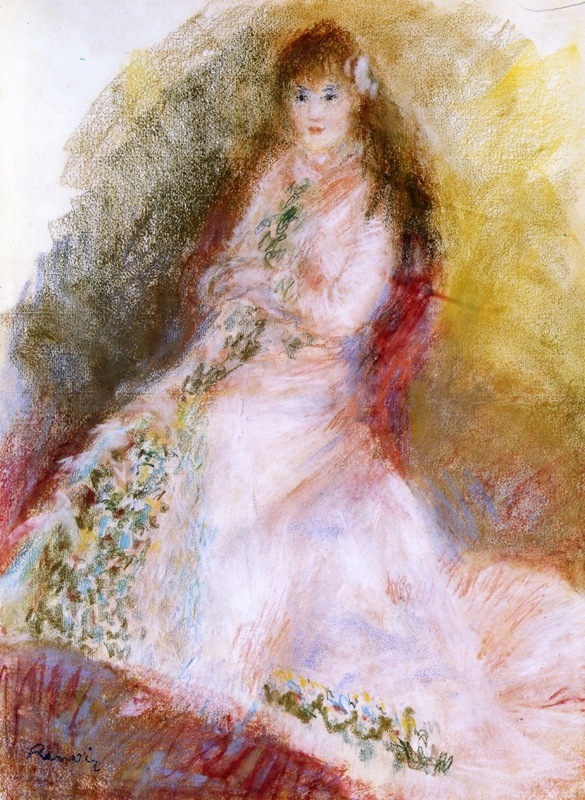 Before pursuing her acting career, Ellen Andrée was a model for a wide range of Impressionist painters. She posed for Manet, Renoir, Degas, Henri Gervex, and more. The paintings of her reveal her powerful spirit and delightful strength. They reveal her true modern qualities. 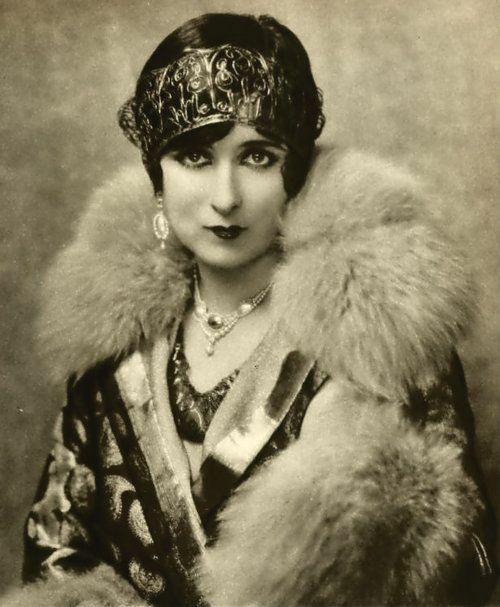 Andrée was a woman who was not afraid to pose provocatively. She was not nervous to live a life of artistic wonder and pursuit. These artistic pieces capture her individuality, her contemporary state of mind. 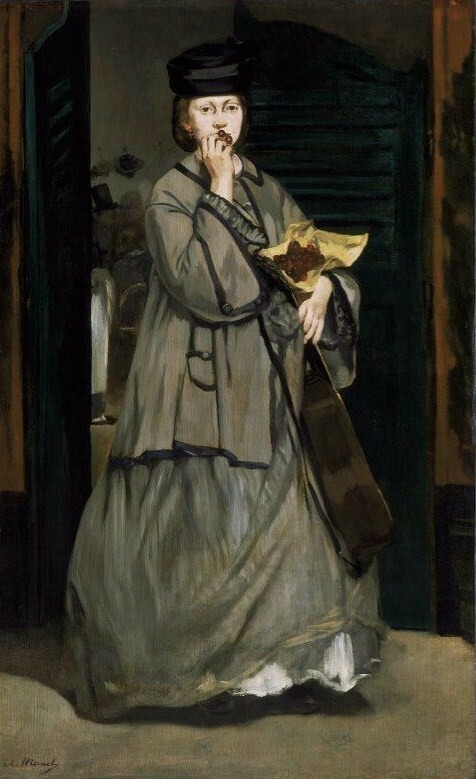 In this beautiful work entitled La Parisienne by Édouard Manet, Ellen Andrée stands with a purpose, with a power that is very much recognizable. She stands as the modern woman of Paris and of everyday society. In an exquisite black day dress, Andrée is the embodiment of dauntlessness and breathtaking determination. The dark, magnificent gown accentuates her form of vitality and her mind and actions of vivacity. In this outfit, with the bold blackened shaped hat, with the sparkling, grand necklace, with the proud, white-trimmed high-neck, with the cascading ruffles on view for all to see, Ellen Andrée radiates–her free-spirited artistic fearlessness speaks out. The model, the actress, rises to the surface. 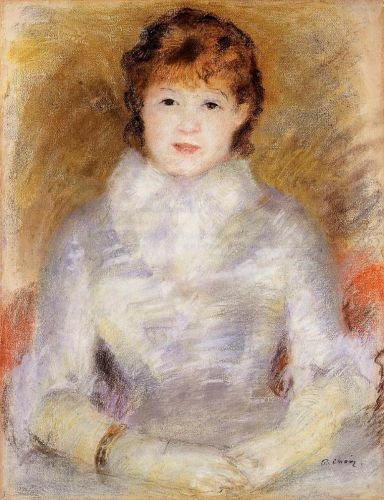 Ellen Andrée’s internal and external beauty is captured magically in this stunning Renoir portrait. Wearing a light, rosy gown accented with a trail of floral details that travel down the front, Andrée’s wonderful presence is made clear. In this shimmering garment of elegance, with a slight smile gracing her lively, blushed face, Ellen Andrée sits with a purpose, with knowledge of who she is and what she can achieve in the world. What she wears only heightens her confidence and natural poise. She recognizes her potential. She embraces her artistic present and the future she wishes to make for herself. She knows who she is. …and her name was Ellen Andrée. And Kathleen Newton and James Jacques Tissot discovered both of these wonderful aspects of the world through their life experiences. They combined them together, forming something wonderful. 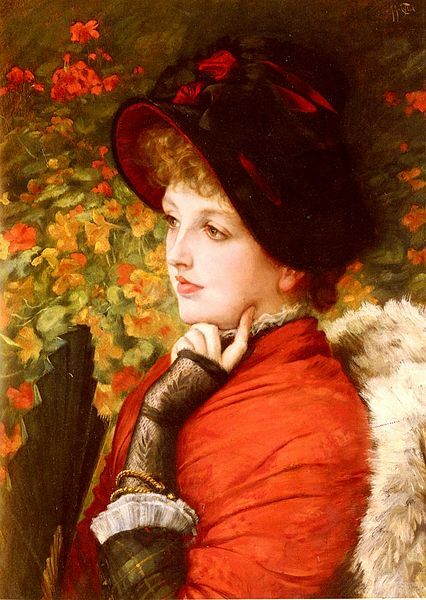 Kathleen Irene Ashburnham Kelly was the Irish mistress, muse, model, and true love of the French artist James Jacques Tissot. Born in 1854, she grew up in the cities of Lahore and Agra, in India. Charles, her father, worked with the East India Company. At the young age of 17, her father desired her to marry Isaac Newton, a surgeon with the Indian Civil Service and set up the match. With no say in the male-dominated, constraining atmosphere, she was forcibly destined to a loveless marriage. During her journey, a man named Captain Palliser became enraptured by her magnificent charm; however, she did not accept his advances. Before the consummation of her marriage to Newton, with a strong faith and honest mind, Kathleen explained the attempt at her innocence by the captain. Considering her damaged and of no more use, Newton instituted divorce proceedings almost immediately. With little of her own money, Kathleen hopelessly agreed on a deal with the captain that he would pay for her way home only if she would become his mistress. Even though she became pregnant, Kathleen refused to marry him, for she did not care for him. Her courage soared . Her daughter was born. Her divorce was finalized. 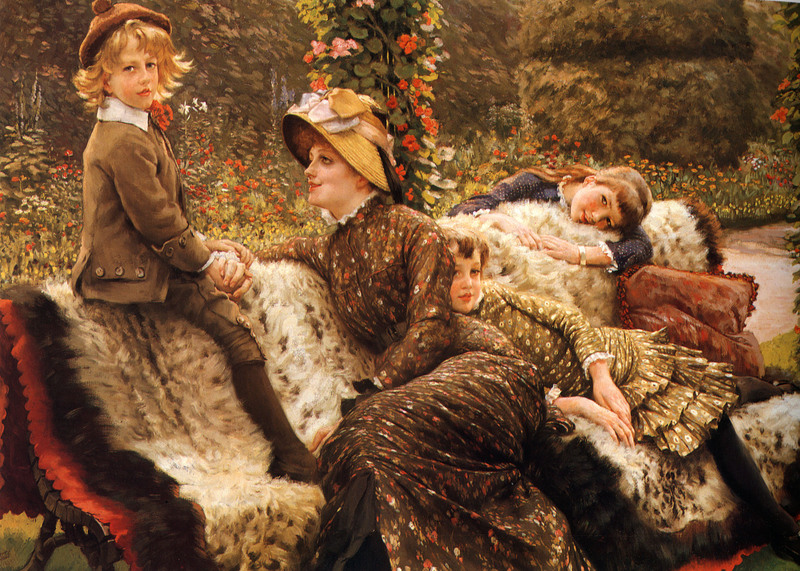 And she met the love of her life, James Jacques Tissot. 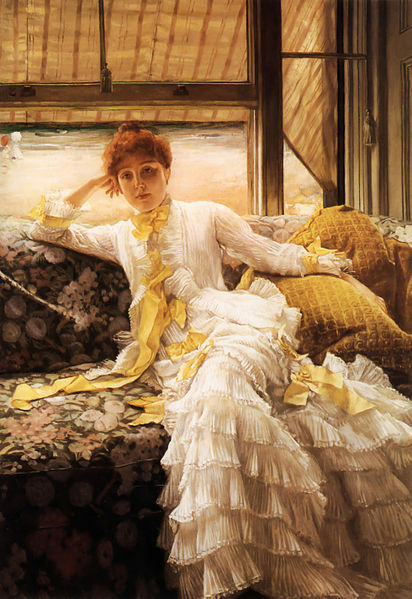 Known to Tissot as ‘Mavourneen,’ “my beloved,” as well as ‘Ravissante Irlandaise,’ “delightful Irish,” Kathleen was depicted in a manner that is absolutely breathtaking. In this artwork entitled Seaside, Kathleen’s beauty is highlighted enchantingly with the outside light brushing gracefully against her smooth cheeks. An intimacy is captured as she casually lounges on the flowered seating. And the fashions she wears emphasizes this extraordinary closeness as she radiates in an airy white summer dress that lacks the customary outerwear petticoats of the time. Kathleen shines in a loose, relaxing creation of dazzling pleats and glistening yellow ribbons. With an aura of seaside loveliness, the romance between James and Kathleen lives within the artwork. In this splendidly elegant painting entitled, Mavourneen, the courageous attributes of Kathleen are shown. She stands with a poise of bravery, a confident purpose that is only heightened by her sumptuous, dark fur-lined coat and matching accented fur hat. Dressed in these grand fashions, in this rich, dignified outfit of grace, Kathleen Newton is depicted as the woman she always was…a woman who was unafraid of criticism, a woman who made her own decisions, a woman who succeeded in finding true love. Unfortunately, at only the age of 28, Kathleen Newton contracted tuberculosis. 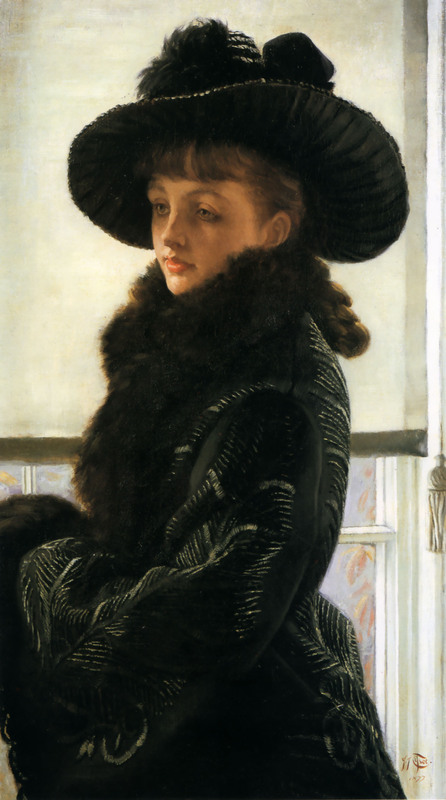 Dying before his very eyes, Tissot was overcome with a painful gloom and heartbreak. No longer capable of watching the man she loved sink into this horrible depression, Kathleen committed suicide by overdosing on laudanum. Although a tragedy, the two of them together were able to, if only for a few short years, live out their dreams of a fulfilling life of family, choice, and romance. And Kathleen was able to live a contented existence of independence and freedom. Delving into the state of Washington, exploring the area of Seattle, entering the mid-1980s, a new subgenre of alternative rock was born–a powerful subgenre that was full of sounds that rejected the norm, the accepted, the conformities put in place by society; a powerful subgenre that was full of the sounds of uncaring attitudes, of no maintenances, of anti-norms; a powerful subgenre that was full of the sounds of metal and punk, of distortion and rawness, of little concern, of little money, and of little harmony. Themes of alienation, apathy, and authenticity were powerfully evoked. Concerns about outside opinions and materialistic desires did not exist. 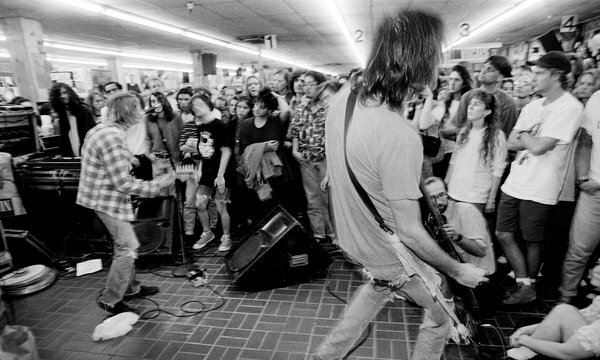 Gaining popularity in the early 1990s with the rise of bands such as Nirvana, the grunge movement rose in prominence. The music was heard. The words were enveloped. And a strongly indifferent fashion movement was created that rejected the common styles and embraced the unkempt, nonchalant approaches to dress. 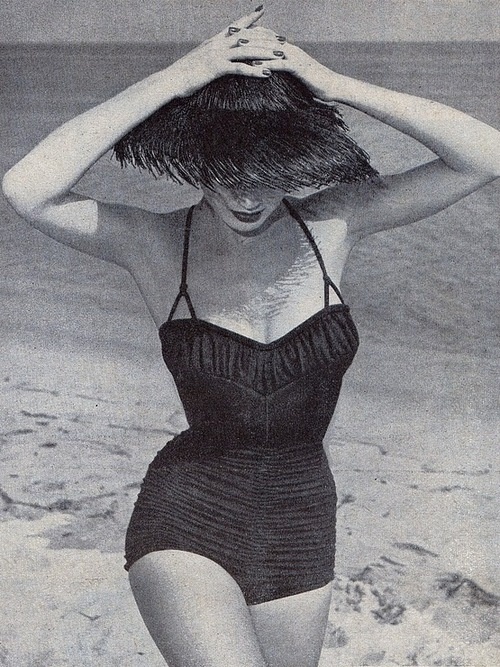 And this strong fashion movement still reverberates in the styles of the world, today. 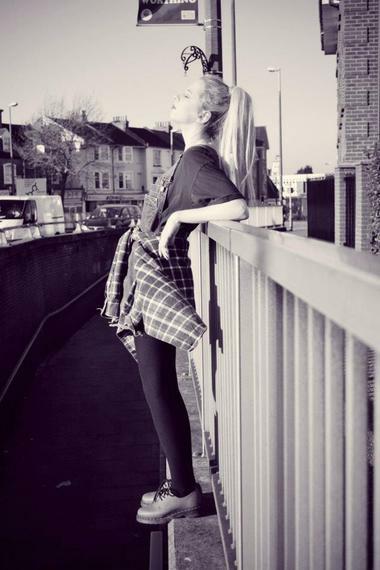 With grunge fashions, there is an unmistakable rawness within each piece of clothing, an unaccented, gritty reality that is disheveled and organic. 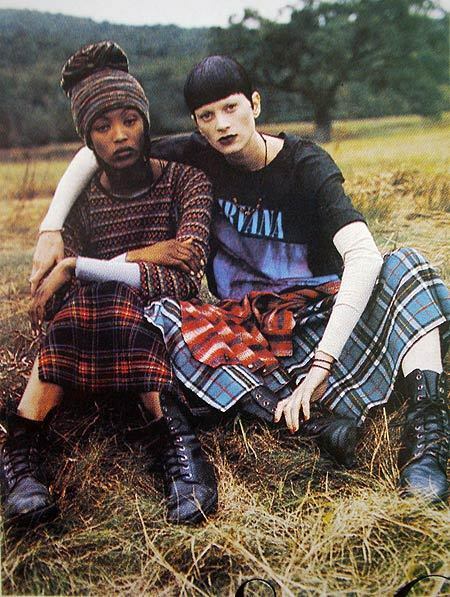 Nothing is glittery, perfect, and over the top–the appearances, like the sounds of grunge, are passive and true. Nothing is concerned and over-emphasized–the appearances are not given too much interest, popularities do not matter, and trends do not come into view. The fashions contain a functionality, as well as a durability that allows wearability for years. The fashions lack expensive taste, with cheap thrift-shop finds and fashions that are not worried about brand name and mainstream allure. The styles of grunge explore the changing weathers of the outdoor world, preparing for the differing seasons throughout the year. They contain androgynous looks. They contain the influences of punk. They simply have a personality. La Belle Époque, the “Beautiful Era” was a prosperous, modern, tantalizing period of French history. It was a period marked by technological, scientific, industrial advancement, as well as influential progression in the arts. 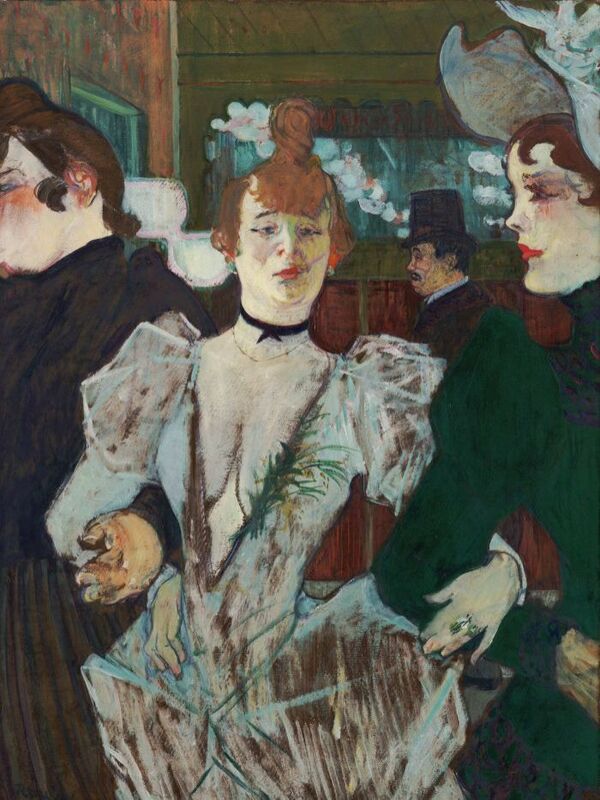 During the Belle Époque, a new, vivacious world was brought to life…a world full of immensely cultural, golden glory. Joy and creativity were given the opportunity to thrive in a colorful, artistic atmosphere. 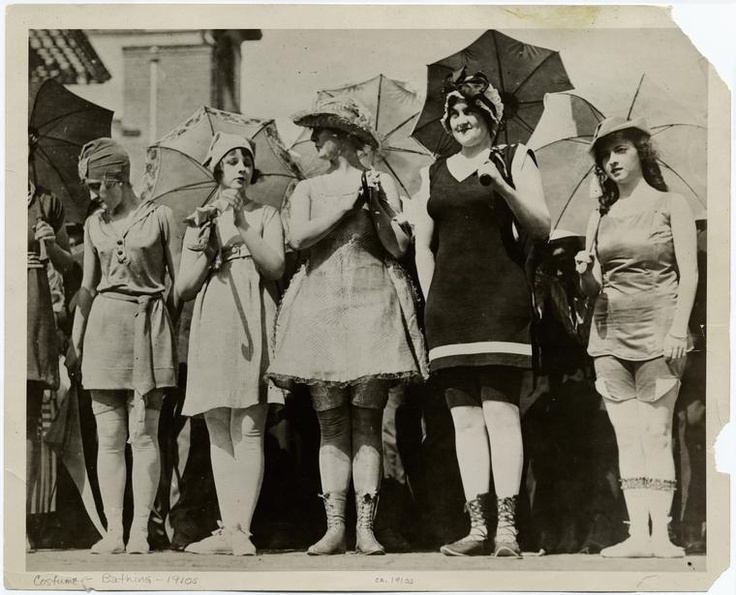 Modern acts and thoughts were given the opportunity to dance and flirt among the throngs of entertainment. There was noise and there was laughter. There was optimism and there was brilliancy. There was art and there was dance. There was burlesque and there were courtesans. 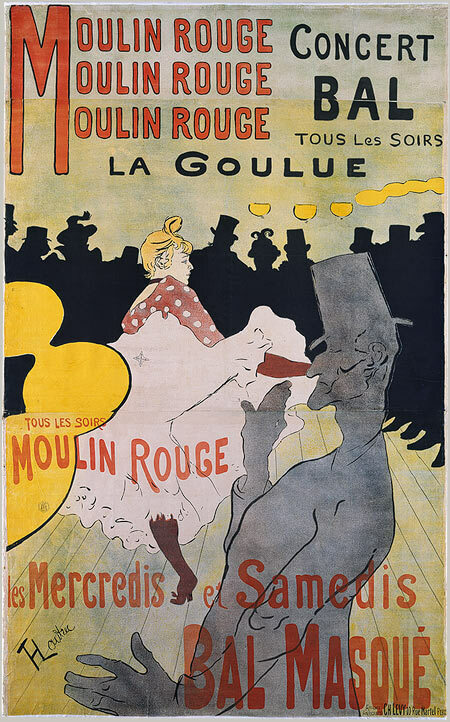 There was Toulouse-Lautrec, there was the Moulin Rouge, and there was the wild, fearless can-can dancer, La Goulue. As mentioned in my post, Seductive Courtesans and a Can-Can Dance!, the Moulin Rouge was a dance hall, brothel, and theater full of pleasurable extravagancy. It was a place where people of all different backgrounds came together to experience the revolutions of society. The morals and boundaries of everyday society were blatantly ignored, as an undeniable elasticity ruled the dance floor. At the Moulin Rouge, youthful dancers moved across the floor with an aura of seduction and inspiration. These dancers came to life among the can-can rhythms and revealing high-kicks. They came to life in the rapidly transformative atmosphere. And one of these dancers was the famous, shameless “Queen of Montmartre,” La Goulue. 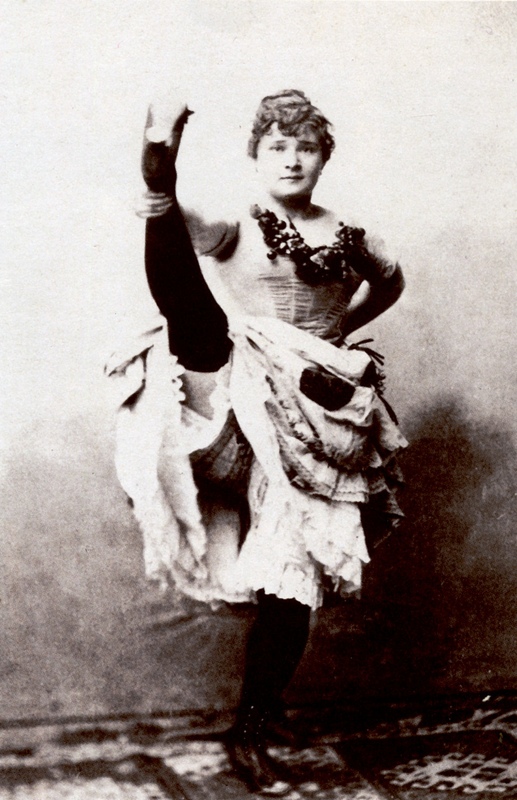 Louise Weber, La Goulue was one of the most celebrated dancers at the Moulin Rouge. She had an outrageous spirit that was daring and outspoken. She had a personality that was captivating in its promiscuous charm. She had a strong passion for dance. Starting at a young age, Weber worked in a laundry with her mother, cleaning the garments of those more fortunate. However, Weber did not allow her laundress occupation stop her from dancing and fantasizing a life for herself in the dance halls of no rules, of transforming roles in society. Behind her mother’s back, Weber borrowed the garments left at the laundry by customers and went at night to the world where she truly belonged, the world of movement and dance. Dancing on tables in small clubs around Paris, flipping off mens hats with her toes, charming audiences with her fearless power and stance, lifting her skirts to reveal a heart embroidered on her underwear, gaining the attractions of the painter Auguste Renoir, and downing the contents of nearby customers drinks, Louise Weber became “the Glutton,” La Goulue. When the Moulin Rouge first opened, La Goulue was there with her dance partner Jacques Renaudin, otherwise known as the very flexible “Valentin le Desosse,” ready to shine under the flashy dance floor. Performing the “chahut,” an early form of the can-can, La Goulue became a permanent headliner of the dance hall. She became a seductive sensation, a wild woman of fame. She was the highest paid entertainer of her day, gaining her earnings based on her captivating audaciousness and exciting movement. She was a dancer of much interest, becoming one of the favorites of Toulouse-Lautrec, the artist, who immortalized La Goulue in his many works of her. 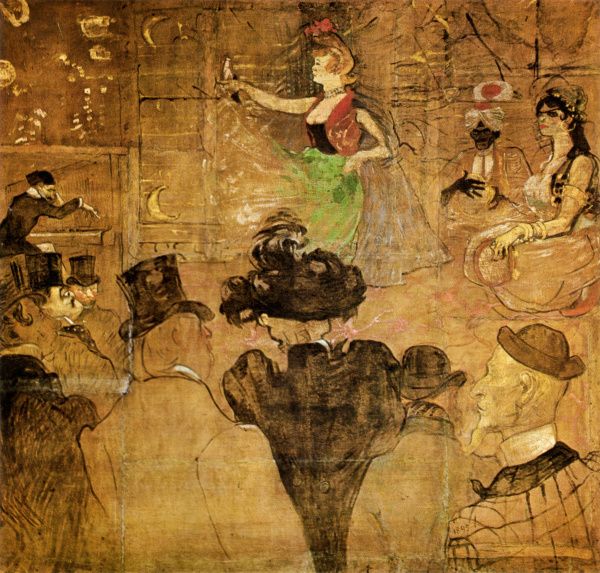 Toulouse- Lautrec was overcome with the beauty and energy of the bohemian lifestyle of Montmartre. He was enraptured by the thrilling theatrical sights around him, more specifically the provocative moments in the fashionable Moulin Rouge. 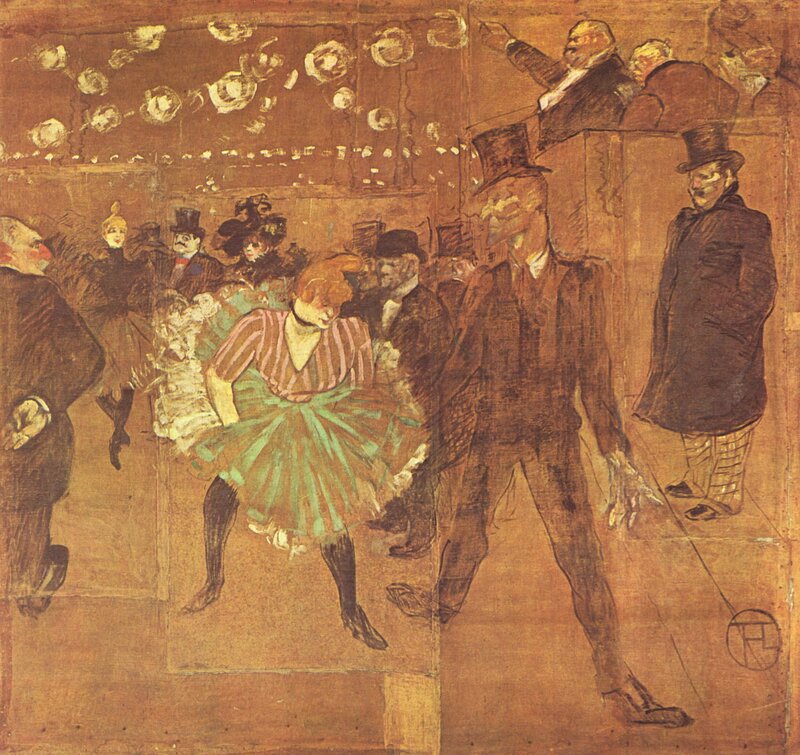 A regular at the dance hall, Lautrec captured the setting and the dancers in many unique, telling artistic pieces, whether they be prints, paintings, or illustrations. With much talent, he captured the essence of La Goulue, her spontaneity and proudness, her character and her spirit. 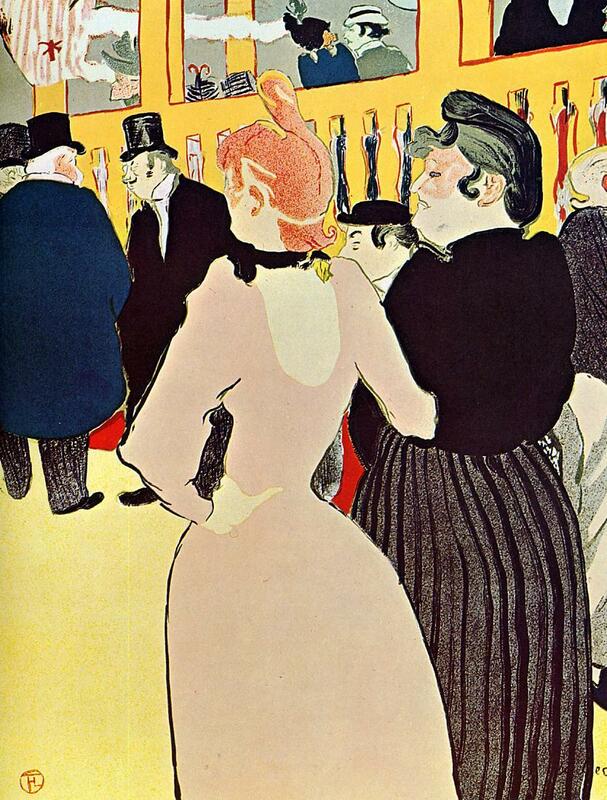 Using his style of simplicity, Lautrec depicted La Goulue and her partner on this boldly minimized, colored advertising poster for the Moulin Rouge. With darkened silhouettes surrounding her dancing form, all attention is focused on La Goulue, her star power, and her thrilling allure. And the simple fashions help add to this allure as well. With bright white petticoats lifted vivaciously in the air, with a dazzling poked dotted top and maroon stockings, La Goulue is shown as the woman she always was, a woman who lived freely, without constraint. A woman who danced with a gaiety that was hard to turn away from, who danced a magical dance that was impossible to erase from memory. The fancier apparels around her do not faze her–she still moves without a care in the world. She defiantly appears to all that surround her. Her salacious livelihood and her originality dance with a risqué, revealing quality. And La Goulue could be spotted dancing with a wonderful freedom. While looking at an artistic masterpiece, fascination cannot help but arise within me when I take a look at the painted persons in the work that move with such an unforgettable presence, that speak with magnificent tones, that feel the surroundings, relationships, and emotions that live amongst them, that stare with storytelling eyes of depth, that travel on journeys to breathtaking lands, and that wear fashions that are significant in the themes and stories they notably emanate. Fascination cannot help but arise within me, especially when I take a deeper look at these painted persons, when I take a look at the females behind the painting, the female models that dazzle with a vital presence. The models that are painted in artistic works have always captured my attention–who were they? Where were they from? What is their story? I have always been mesmerized by the lives of these interesting females, always intrigued by their movements and sights in daily life…the historic moments that they witnessed, the talents that they came across, the occupations that they delved into, the lives they carried out. I have always been mesmerized by these models who wear fashions that are so important to works of art…fashions of embroidered, velvet gowns, as well as feminine, airy summer dresses, fashions of magnificently wide, patterned skirts, as well as modernly defined, freshly cut slacks, fashions of conservative evening wears, as well as coquettish, bold undergarments. Victorine Meurent is one of these models that capture my attention. 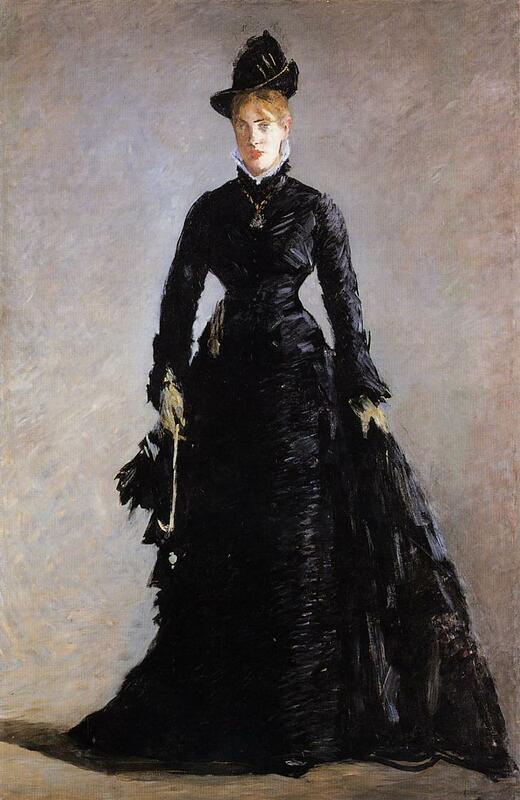 Victorine Meurent was a famous model for painters such as Edgar Degas, Alfred Stevens, and especially, Édouard Manet. Born to a family of artisans, Meurent came from a poor, working-class background. She began modeling at the age of sixteen with Thomas Couture, as well as performing musically in cafés during her years. 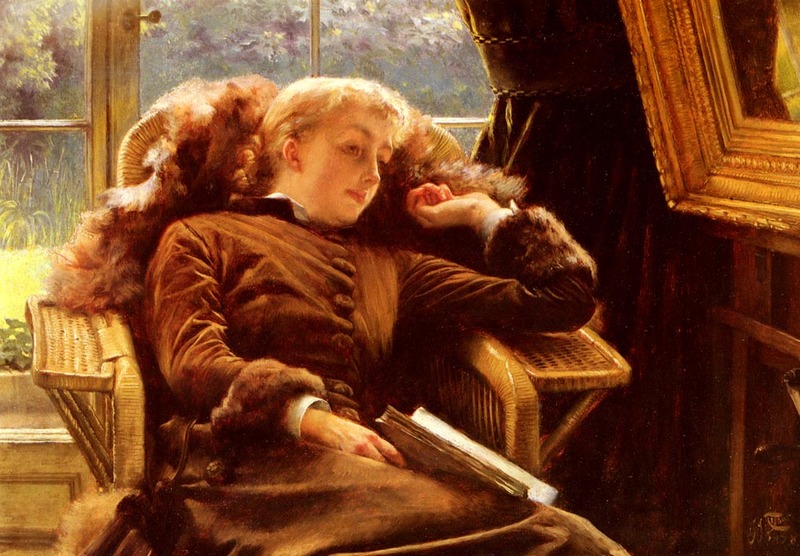 And she had a powerful desire and firm ambition to make a name for herself as a female artist (which she did succeed in fulfilling by taking painting classes at the Académie Julian and having her works appear at the 1876 Salon and other future exhibitions). 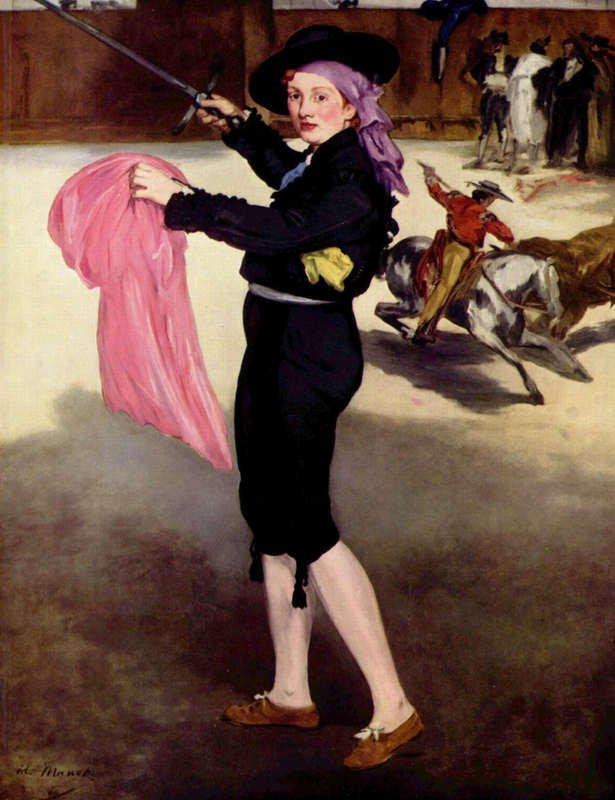 Meurent was known as Manet’s favorite model, appearing in numerous, gender-breaking works, that defied the constraints and moral commonalities of society. In these works, the modern desires and personalities of both Meurent and Manet rise to the surface. Meurent’s own independence appears, her desire to tear away at gender norms and to succeed in a profession not readily acceptant of women, her desire to live a life uncommon for women at the time in society and to paint freely, without restriction. 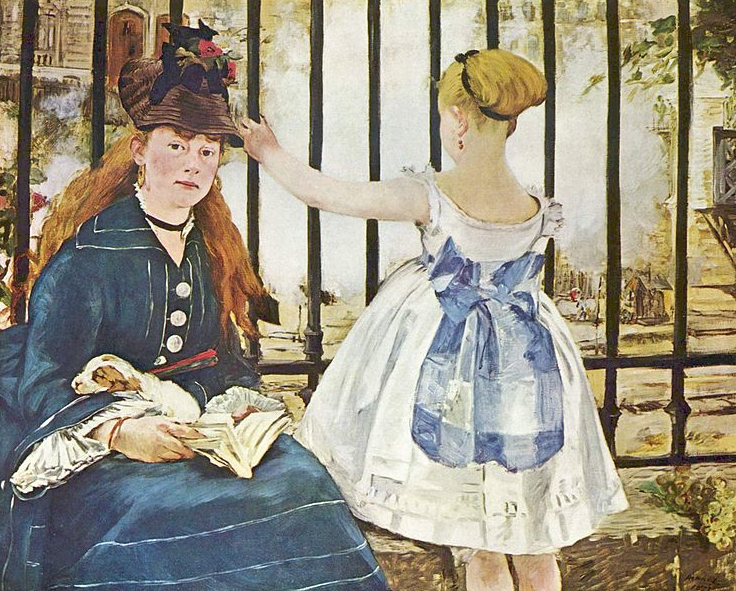 Manet’s naturalistic depiction of the world appears, his creative, avant-garde mindset that wanted to challenge the traditional rules around him. The fashions in these works help to further reveal these thoughts of autonomy and conviction and these actions of rebellion and defiance. 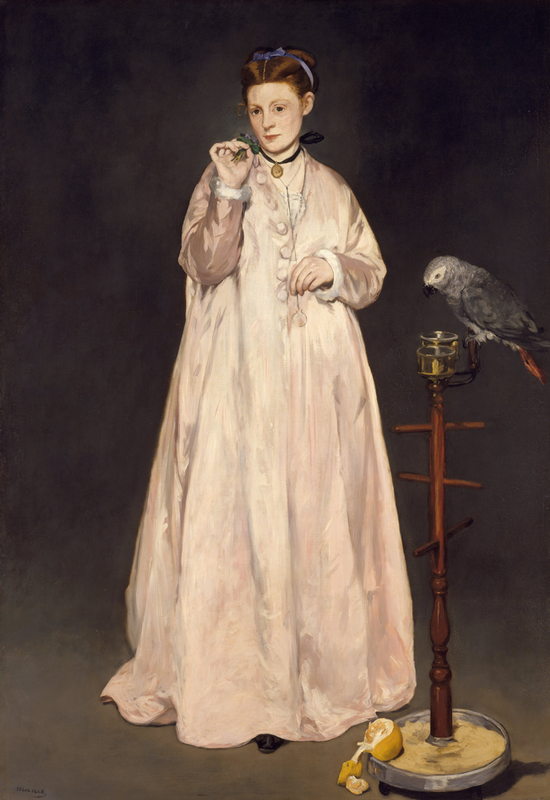 In Manet’s works such as Young Lady in 1866…(shown above), Victorine Meurent is depicted wearing a pale pink, satin dressing gown, a peignoir, that is only meant to be seen and worn indoors. This visibly intimate article of undress and Meurent’s teasing pose help to signify both Meurent’s and Manet’s modern outlooks on society and life, in general. Meurent is not painted with the following and praise of conservative, customary guidelines–Meurent is painted as a woman with a brazen attitude and a seductive stance, a woman of a modern era. With the fashionable item of the peignoir worn, the alluring quality of boldness within Meurent is shown. 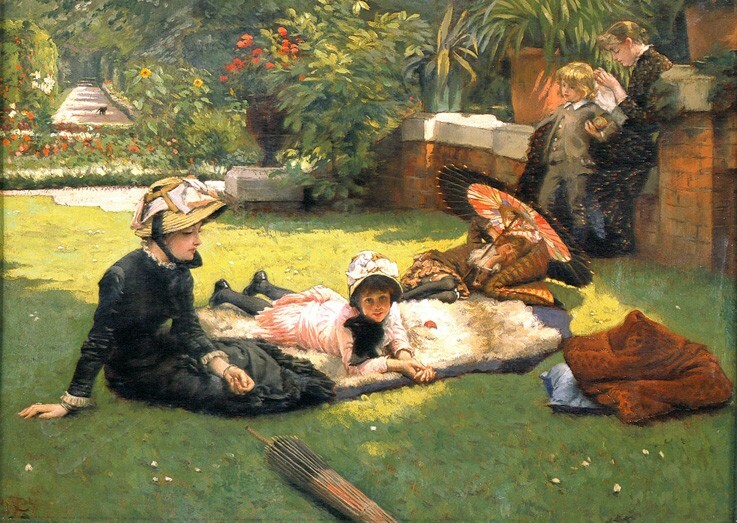 In Manet’s works such as Luncheon on the Grass (Le déjeuner sur l’herbe)…(as previously shown in my May inspiration post, Barriers and Constraints are Broken), Meurent is depicted as a woman unafraid of judgements and established traditions. She is depicted as a woman who is proud of herself, her mind and her body, and uncaring of the rules society enforces. 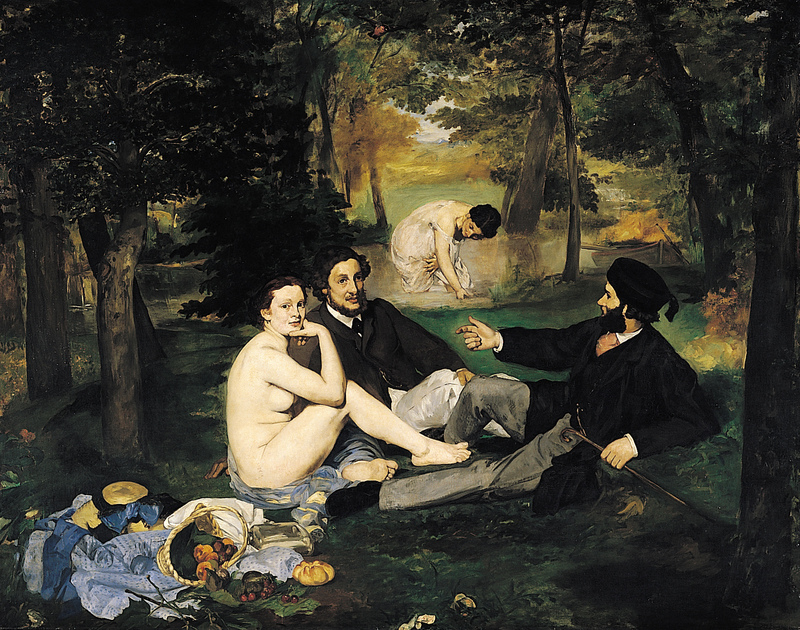 Meurent’s lack of clothing, along with the background female’s sheer white day dress, contrasting with the full contemporary day wear fashions of constrictive black coats and collard shirts worn by the surrounding men, further emphasizes Meurent’s own personal desire to break gender restrictions and Manet’s wish to remove restrictive moral conventionalities from expression. Victorine Meurent stares at the viewer with an aura of calmness, confidence, and modernity, demolishing female stereotypes and embracing liberation. And the lives these women (models) behind the paintings really lived are just as fascinating.